This button is the most common shape utilized in DTH Bits. This type of shape is the strongest and most resistant to breakage. The domed shape provides excellent penetration in medium rock, hard rock and hard rock broken formations, in all types of drilling. This is the standard button that will be quoted unless specified otherwise. Normally, this button is used in less hard consolidated drilling formations. This type of button is very aggressive and drills faster than dome. However, because the ballistic tip protrudes out farther than dome, the ballistic is prone to breakage if used in the wrong formations. Care should be used when drilling with this type of button. Ballistic buttons yield high penetration rates and efficient rock breakage. Wear Pads are used in conjunction with either of the two types of buttons mentioned above. These flat top buttons are placed on the bit skirt, behind the gauge row buttons. They are utilized to enhance bit life in areas where extreme body wear has occured on the bit skirt. Reversing buttons are often utilized on bits with oversized heads and on standard heads where clearance allows. 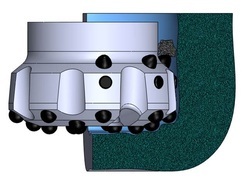 The reversing buttons are used most often in broken rock formations to allow the bit to drill slowly up and out of the hole, when broken rock has fallen in behind the bit and hammer. Either ballistic or dome buttons can me used and the number of buttons is variable. This concept is also used on the backhead or topsub of the DTH Hammer for the same purpose. Rock Hog engineers have chosen the best all around button size and number of buttons for each size bit. Large carbides tend to last longer, are less likely to have shear failure, and require less frequent sharpening. Smaller carbides tend to drill faster. However, the sharpening interval is more frequent and they wear out faster. DTH Bits tend to have larger buttons on the guage row and smaller buttons in the center. Rock Hog uses only carbide grades with excellent resistance to wear and high toughness yields.